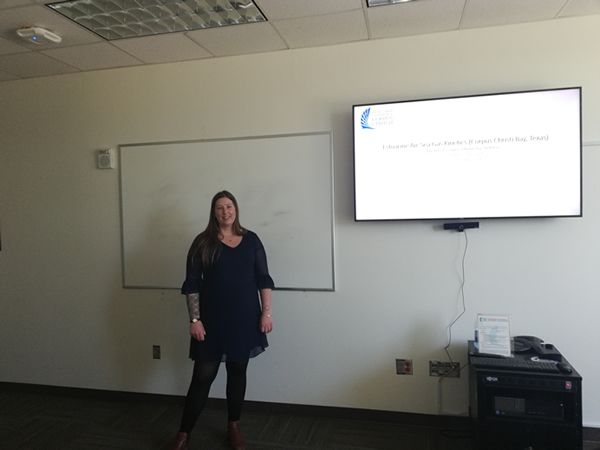 April 10, 2019: Corrie successfully defends her MS thesis entitled "Estuarine Air-Sea Gas Flux Kinetics, Corpus Christi Bay, Texas" and is getting ready to move to the University of Maine for a Ph.D.! 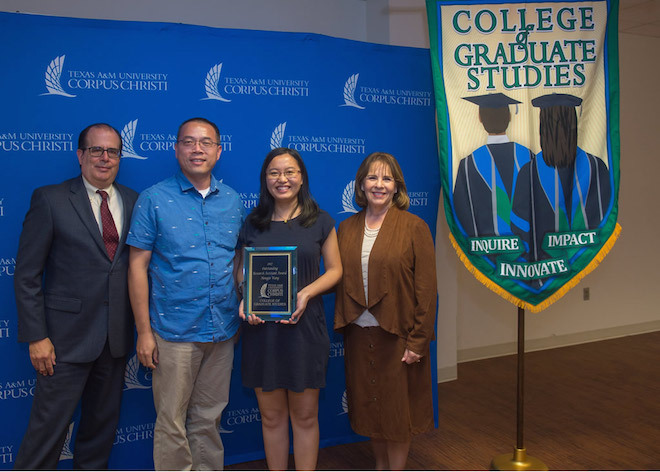 April 4, 2019: Hongming wins the Second Place in TAMU-CC's Three Minute Thesis (3MT®) competition! The title of his talk is "Hydrologic control on CO2 flux in four Texas coastal estuaries". March 21, 2019: Xinping presents a talk "Decadal changes in the carbonate chemistry in northern Gulf of Mexico waters – Rising CO2, “leaked” nutrient and potential sea changes" (via WebEx) at the T.W. Bennett Symposium held in the University of Southern Mississippi. February 25, 2019: Melissa presents a talk entitled "Temporal variability and driving factors of the carbonate system in the tidal inlet of a semiarid estuary" at the ASLO Aquatic Sciences Meeting in San Juan, Puerto Rico. February 18, 2019: A paper entitled "Time of emergence of surface ocean carbon dioxide trends in the North American coastal margins in support of ocean acidification observing system design" with Hongjie and Xinping as coauthors was accepted for publication in the journal Frontiers in Marine Science. December 11, 2018: Xinping presents a talk "Effect of organic alkalinity on seawater buffer capacity - A numerical exploration" at the 2018 American Geophysical Union Fall Meeting. November 11-13, 2018: Dr. Wade McGillis and Haokai Zhao visit the CCL and set up CO2 flux measurements using eddy covariance in Corpus Christi Bay. November 8-10, 2018: Melissa and Larissa attend the 2018 Gulf Estuarine Research Society Biennial Meeting and present their research. 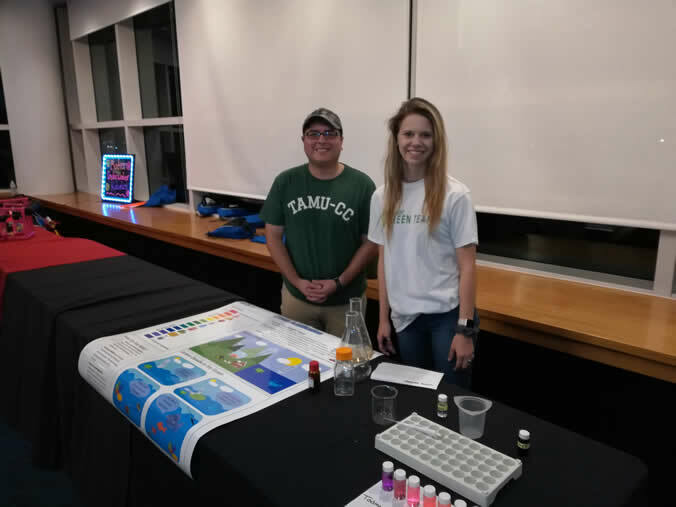 November 8, 2018: The CCL participates in the National STEM Day exhibition and presents the theme "ocean acidification" at the Texas State Aquarium. Thanks to Victor Delgado and Susan McGuire from Dr. Brandi Reese's lab for volunteering! October 22, 2018: Hongjie's paper entitled "Oxygen consumption and organic matter remineralization in two subtropical, eutrophic coastal embayments", the final chapter of her Ph.D. dissertation, is accepted for publication in the journal Environmental Science & Technology. 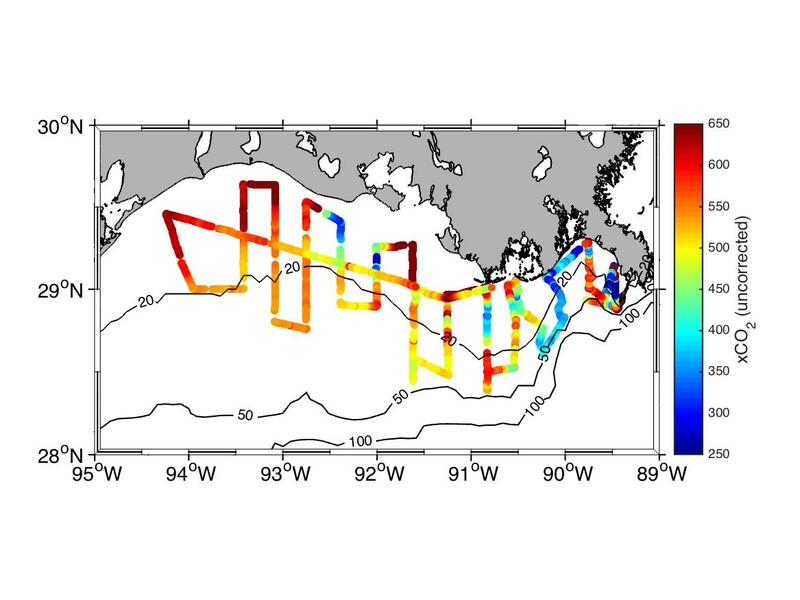 September 17, 2018: Hongjie's paper entitled "Drivers of oxygen consumption in the northern Gulf of Mexico hypoxic waters - A stable carbon isotope perspective" is accepted for publication in the journal Geophysical Research Letters. September 13, 2018: Xinping presents a seminar "Disparate Responses of Estuarine and Ocean Acidification to Aerobic Respiration" at the Gulf Coast Research Laboratory, University of Southern Mississippi. August 23, 2018: Xinping presents "Two tales of one storm" at the Harvy Research Symposium held in Port Aransas, TX. April 16, 2018: Xinping gvies a seminar "Estuarine Acidification - Through the Looking Glass" at the Department of Oceanography, Texas A&M University. July 14, 2018: Xinping's manuscript entitled "Seasonal variability of carbonate chemistry and decadal changes in waters of a marine sanctuary in the Northwestern Gulf of Mexico" is accepted for publication in the journal Marine Chemistry. June 11, 2018: Two Foy Moody High School students join the Carbon Cycle Lab as summer interns. Welcome Terrion Franks and Alvito Saavedra! June 10-15, 2018: Melissa and Hongming attend the ASLO 2018 Summer Meeting in Victoria, Canada. May 29, 2018: Mr. Esteban DeLaRosa (B.S. Class of 2018) joins the Carbon Cycle Lab as a summer intern. May 22, 2018: Xinping's coauthored paper "Effect of hydrological variability on the biogeochemistry of estuaries across a regional climatic gradient" is accepted by the journal - Limnology and Oceanography. This is a study funded by the NOAA’s National Center for Coastal Ocean Science. 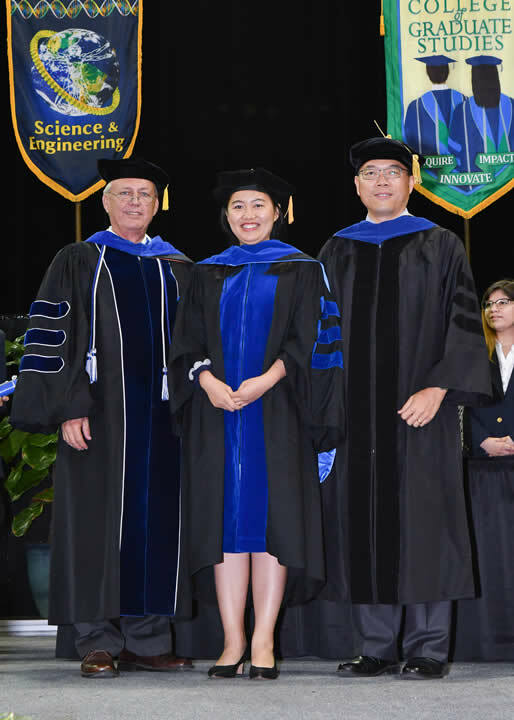 May 12, 2018: Dr. Hongjie Wang officially graduates from TAMUCC. April 18, 2018: The Carbon Cycle Lab receives Scientific Research Disaster Recovery Grant from the the National Academies of Sciences, Engineering, and Medicine Gulf Research Program. This	fund	will	be	used to replace lost equipment due to Hurricane Harvey and support us to continue examining carbonate chemistry in the Mission-Aransas Estuary. March 26, 2018: Hongjie successfully defends her dissertation entitled "Drivers of Carbon and Oxygen Dynamics in Disparate Marine Ecosystems". Job well done, Hongjie! February 27-28, 2018: Xinping attends the mini-symposium organized by the Flower Garden Banks National Marine Sanctuary on a localized coral reef mortality event back in 2016. February 27, 2018: Xinping's coauthored paper entitled "Temporal and spatial fluctuations of groundwater-derived alkalinity fluxes to a semiarid coastal embayment" led by colleauge Dr. Dorina Murgulet is accepted for publication in the journal Science of the Total Environment. February 11-17, 2018: The Carbon Cycle Lab is at the 2018 Ocean Sciences Meeting in Portland, OR. Five studies authored and coauthored by lab members are presented. 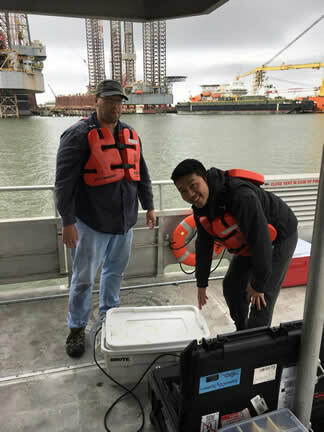 February 9, 2018: Cory and Hongming are at Galveston Bay surveying sea surface pCO2 on board the R/V Manta. January 31, 2018: Xinping's coauthored paper "Continental shelves as a variable but increasing global sink for atmospheric carbon dioxide" is published in Nature Communications. December 16, 2017: Melissa wins the Atlee M. and John W. Cunningham Memorial Research Award. The award is established for graduate students in the following research focus areas: coastal, marine, and environmental sciences with an emphasis on watershed resources, processes, and policies. The Center for Coastal Studies of Texas A&M University - Corpus Christi adminsters this award. December 11, 2017: Melissa wins the Outstanding Teaching Assistant Award of 2017, adminstered by the College of Graduate Studies, Texas A&M University - Corpus Christi. December 2, 2017: Hongjie wins the First Place on the poster "Modeling of Dissolved Oxygen and pH Dynamics in Baffin Bay" that she presents at the 7th Annual Research Forum hosted by the Marine Science Graduate Student Organization. November 5-9, 2017: The Carbon Cycle Lab is at the Coastal and Estuarine Research Federation Biennial Meeting. September 25-26, 2017: Hongjie attends the Ocean Carbon Hot Spots Workshop sponsored by the U.S. Climate Variability and Predicability Program in Moss Landing, CA. Her poster presentation is entitled "Multi-decadal fCO2 trends in Western Boundary Current- and Eastern Boundary Current-Dominated Margins". September 20, 2017: The Carbon Cycle Lab, as a part of a research team that has two other labs at TAMUCC, receives funding from the National Science Foundation to study the effect of Hurrican Harvey on Texas' coastal lagoons. September 18 Melissa is elected as the Student Representative for the Gulf Estuary Research Society (GERS), a regional Affiliate Society of the Coastal and Estuarine Research Federation. She will serve the 2017-2019 term. August 30, 2017: Hongjie and Melissa both receive travel award from CERF2017 to attend the meeting in Provindence, RI. August 10, 2017: Hongjie's paper entitled "Decadal fCO2 trends in global ocean margins and adjacent boundary current-influenced areas" is accepted for publication in the journal Geophysical Research Letters. 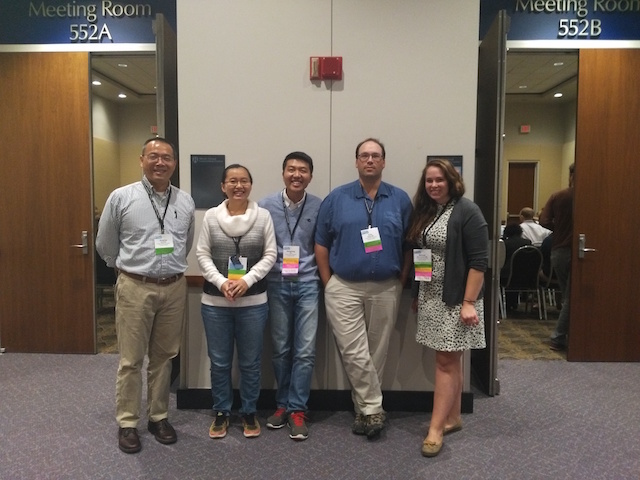 July 22-28, 2017: Melissa and Hongming attend the Gordon Research Seminar and Gordon Research Conference on Chemical Oceanography in New London, NH, and present two posters entilted "CO2 flux and long-term pCO2 trends of the estuaries of the Northwestern Gulf of Mexico" and "Hydrologic control on CO2�fluxes in subtropical estuaries", respectively. July 19, 2017: Melissa successfully passes qualifying exam and enters Ph.D. candidacy. July 10, 2017: Hongming's manuscript entitled "Responses of carbonate system and CO2 flux to extended drought and intense flooding in a semiarid subtropical estuary" is accepted for publication in the journal Limnology and Oceanography. May 19, 2017: Hongjie and Melissa are both awarded grants from the Texas Sea Grant Grants-In-Aid Program for their dissertation research. 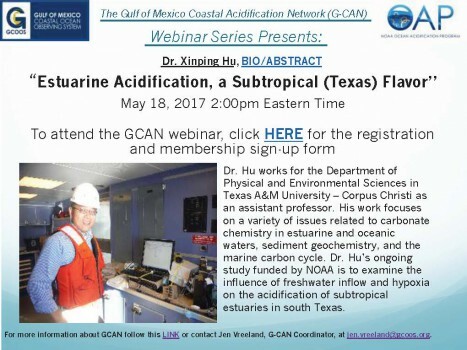 May 18, 2017: Xinping gives a webinar entitled "Estuarine Acidification, A Subtropical (Texas) Flavor” to the Gulf of Mexico Coastal Ocean Observing Network (G-CAN). The recorded webinar can be found here. April 25, 2017: Xinping's manuscript "Effects of eutrophication and benthic respiration on water column carbonate chemistry in a traditional hypoxic zone in the Northern Gulf of Mexico" is accepted for publication in the journal Marine Chemistry. April 12-13, 2017: The Carbon Cycle Lab is at the 2017 Texas Bays and Estuaries Meeting. Two presentations are given by the lab members (Hongjie and Hongming) and Xinpign is also a coauthor on another presentation given by Dr. Wetz's lab. April 4, 2017: Hongjie won the Outstanding Research Assistant Award of 2017. March 26-29, 2017: Hongming attends the 2017 Joint NACP & AmeriFlux PI Meeting in North Bethesda, MD and presents a poster entitled "Hydrologic Control on CO2 Fluxes in Subtropical Estuaries". Feb 27, 2017: The Carbon Cycle Lab will receive funding from the National Science Foundation to study estuarine carbon cycling and acidification (Campus News). Feb 24, 2017: Xinping visits Foye Moody High School and gives a presentation "Ocean and Estuarine Acidification" to students in the Aquatic Science class. Jan 23-27, 2017: Dr. Björn Wissel from University of Regina (Canada) visits the Carbon Cycle Lab. January 4-5, 2017: Xinping attends NOAA's Ocean Acidification Program PI meeting. December 20, 2016: Hongming successfully passes qualifying exam and enters Ph.D. candidacy. December 2, 2016: Melissa presented a talk entiled "Estimating air-sea CO2 flux and long-term pCO2 trends of the northwestern Gulf of Mexico estuaries" at the Third Graduate Research Symposium organized by the MSGSO and won the second prize! 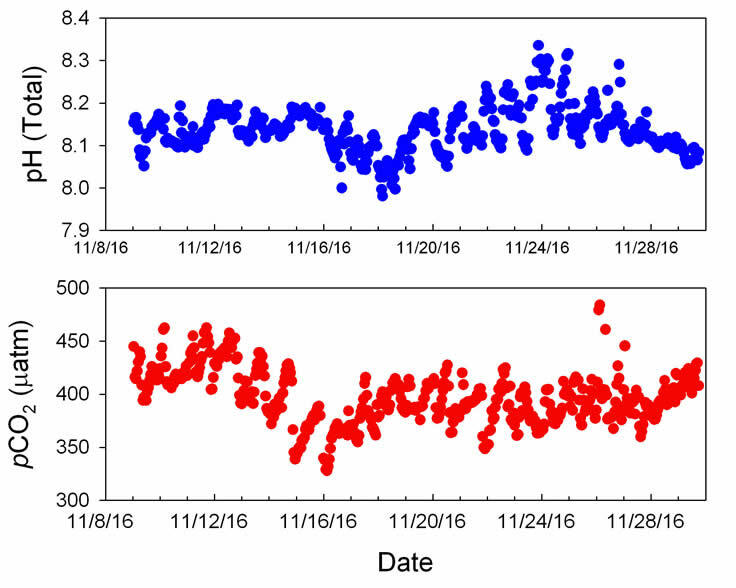 November 29, 2016: Carbonate chemistry monitoring at the Aransas Ship Channel has been running for three weeks! Below is a glimpse of the raw data that we have collected (hover your mouse to enlarge the figure). November 2-4, 2016: The Carbon Cycle Lab is at the Gulf Estuarine Research Society Fall Meeting. Three presentation are given by lab members. September 19: Xinping co-authored paper "Coral calcification under environmental change: A direct comparison of the alkalinity anomaly and buoyant weight technique" is accepted for publication in the journal Coral Reefs..
August 22-23, 2016: The Carbon Cycle Lab is at sea in the northern Gulf of Mexico. July 15, 2016: Hongjie successfully passes qualifying exam and enters Ph.D. candidacy. June 1, 2016: Lucas starts summer REU intership at the University of Texas Marine Science Institute. May 23, 2016: Hongjie's paper "A new statistical approach for interpreting oceanic fCO2 record" was accepted for publication in the journal Marine Chemistry. April 13-14, 2016: The Carbon Cycle Lab is at the 12th Texas Bays and Estuaries Meeting in Port Aransas, TX. Three presentations are given by the lab members and Xinpign is also a coauthor on two other presentations given by Drs. Murgulet's and Wetz's labs. March 14, 2016: The Carbon Cycle Lab, among a total of five research groups at TAMUCC that received funding from the Texas General Land Office under the Coastal Management Program, will initiate a project to examine the role of groundwater discharge on alkalinity budget in the semiarid Copano Bay in south Texas. February 21-26, 2016: The Carbon Cycle Lab is attending the 2016 Ocean Sciences Meeting @ New Orleans, LA. Four	presentations	are	given by the lab members and Xinping also coauthors an additional three other presentations. February 19, 2016: Xinping gave a talk entiled "Ocean Acidification - Myths, Facts, and a Case Study in a South Texas Estuary" at the Harte Institute for Gulf of Mexico Studies. November 8-12, 2015: Xinping is at the 23rd Biennial Conference of the Coastal and Estuarine Research Federation. He presents a talk entitled "Acidification of a Shallow Subtropical Estuary - Reduced Freshwater Inflow, Hypoxia, and Ocean Acidification". Meanwhile, a poster presentation entitled "A Stable Isotope Study on Organic Matter Driving Oxygen Consumption in Two South Texas Estuaries" prepared by Hongjie is also given at this conference. November 2, 2015: In collaboration with the Coastal Bend Bays and Estuaries Program (CBBEP), the Carbon Cycle Lab will start monitoring estuarine carbonate chemistry in Aransas Pass. 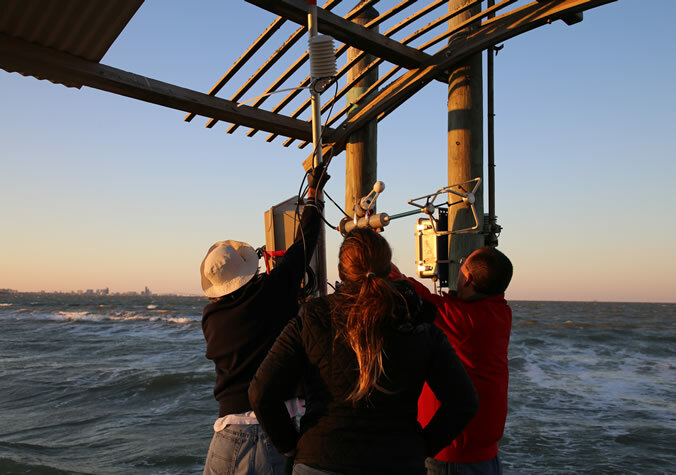 August 25, 2015: The Carbon Cycle Lab conducts the second field survey in southeastern Corpus Christi Bay for hypoxia and carbonate chemistry studies. July 27-Aug 4, 2015: Xinping participates the Shelf Wide Cruise on board R/V Pelican in the Northern Gulf of Mexico. 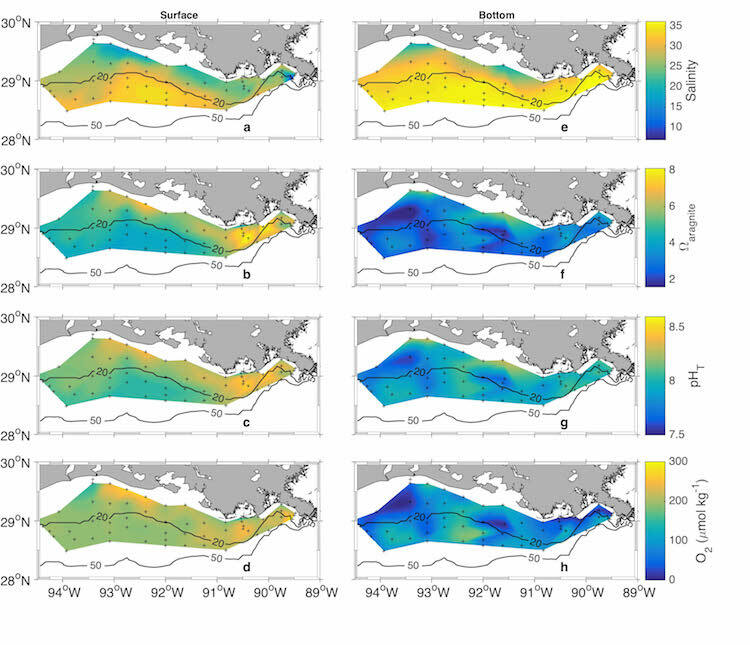 Below is a distribution of sea surface CO2 concentration (hover your mouse to enlarge the figure). July 26-31, 2015: Hongjie attends the Gordon Research Conference - Chemical Oceanography at Holderness, NH and presents a poster entiltled "A New Statistical Approach for Interpreting Ocean fCO2 record". June 24, 2015: Melissa successfully defends her Master's thesis entitled "Investigating the Role of Nonconsumptive Predator Effects on Calcification, Respiration, and Carbon Cycle Contribution of Juvenile Eastern Oysters (Crassostrea virginica)". June 9, 2015: The Carbon Cycle lab conducts a field survey in southeastern Corpus Christi Bay for hypoxia and carbonate chemistry studies. 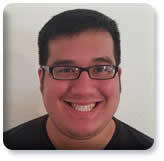 April 8, 2015: Hongming presents a talk entiled "Alkalinity Dynamics in a South Texas Estuary" at the 2015 Texas Bays and Estuaries Meeting held in Port Aransas, TX. March 31, 2015: Dr. George T. F. Wong, Distinguished Research Fellow of Academia Sinica of Taiwan, visits the Carbon Cycle Lab. March 13-15, 2015: Melissa give a talk entitled "Investigating nonconsumptive predator effects on the eastern oyster" at the 2015 Gulf of Mexico Graduate Student Symposium held in Dauphin Island, AL. February 17, 2015: a new study led by Xinping entitled "Long-term alkalinity decrease and acidification of estuaries in Northwestern Gulf of Mexico" is accepted for publication in the journal Environmental Science and Technology. Hongjie and Xinping are at the 2015 Oil Spill and Ecosystem Science Conference. Hongjie's	presentation	is	entilted	"Evidence of Cross-shelf Inorganic Carbon Export in the Northern Gulf of Mexico". February 16, 2015: Mr. Cory Staryk (M.S.) joins the Carbon Cycle Lab as a Research Technician. December 3, 2014: Melissa give an oral presentation entitled "Nonconsumptive effects of predators may alter calcification and respiration rates of the Eastern oyster" at the 4th Annual Marine Science Graduate Student Organization (MSGSO) Student Research Forum and won the 2nd Place Prize. November 10, 2014: Hongming and Xinping participate in a field survey to the Flower Garden Bank National Marine Sanctuary. August 19, 2014: Xinping presents a poster entitled "Long-term alkalinity decrease and acidification of estuaries in southwestern United States" at the "Coastal CARbon Synthesis (CCARS) Community Workshop" held in Woods Hole Oceanographic Institution. Juy 26, 2014: Hongjie participates in the Shelf Wide Cruise on board R/V Pelican in the Northern Gulf of Mexico. May 19, 2014: Melissa and Qiyuan participate in the Western Atlantic Climate Study 2014 cruise on board R/V Knorr in the North Atlantic Ocean. They will collect samples for characterizing seawater CO2 system and stable isotopes. May 14-16, 2014: Hongjie participates in a field survey to the Flower Garden National Marine Sanctuary. April 23, 2014: Melissa gives a poster presentation entitled "Long-term alkalinity decline in dewatering Texas estuaries" at the 2014 Texas Bays and Estuaries Meeting and wins the 1st Place Prize for student poster presentations. Jan 26, 2014: Hongjie give a poster presentation entitled "Stable isotope composition of remineralizing organic carbon in the northern Gulf of Mexico continental shelf sediments" at the Gulf of Mexico Oil Spill & Ecosystem Science Conference in Mobile, AL. Jan 14, 2014: Hongming Yao (MS, 2013, China Ocean University) joins the Carbon Cycle Lab. July 21-28, 2013: Shelfwide cruise in northern Gulf of Mexico (Link).